This is Joshua Blessed, I am a man of Yahweh, who lives by the spirit of Yahweh. And today I would to make an another video’s testimony, as an encouragement to all my brothers who suffers persecution, imprisonment or death. And I hope that this testimony shall be a blessing to as many as Yahweh called to life and life everlasting. 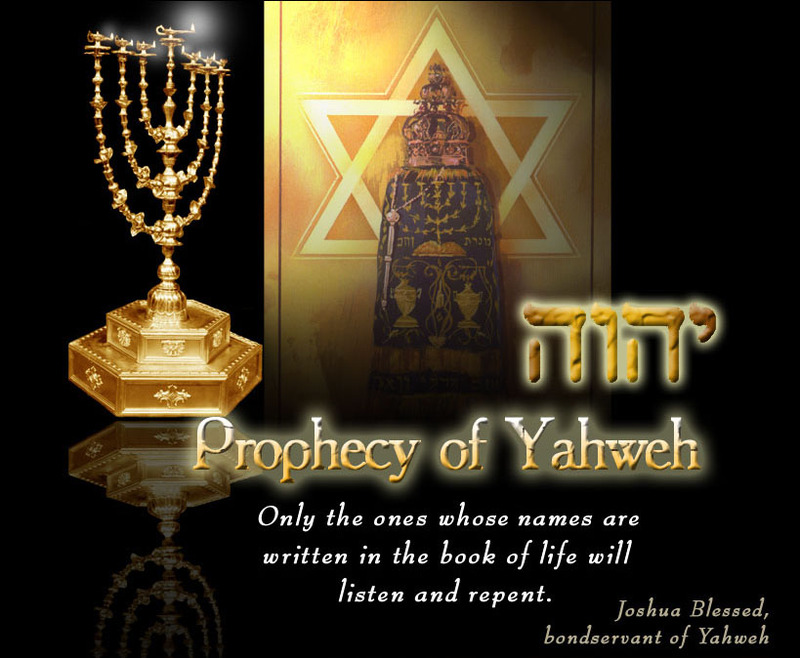 Yahweh descended from heaven, and gave me repentance and forgiveness of my sins and baptized me with the holy spirit. And so than my spiritual life begin. And I would to be a married, and in those time, I fasted three days and three nights. And on the third day, I received a vision and revelation from heaven, which woman I should take as my wife. So, I shared this what I received from heaven with a certain girl and she also fasted and prayed and God revealed to her that I shall be her husband. So, it was so blessing to me that even heaven guided me in this is my marriage. After we been married , Yahweh began to chastised me correct me and removed all religious trash from my life; He showed me very plainly that He was raised from the dead on the Shabbath, and He said that I should be a Shabbath keeper. Then in our marriage in our family war begins. My wife still keeps the Sunday and attending a Church on Sunday, but I became a Shabbath keeper. And it was much fighting at home every Shabbath and every Sunday. And so, then Yahweh revealed to me that Trinity is an abomination of the heathen, and I repented of these lies and no longer believe nor follow these false teaching. Then many things, Yahweh began to purge me and correct me of my false Christian beliefs/religions. And more He revealed to me and more and more we began fighting at home between my wife and myself. So; As a Shabbath keeper, I rested at home and my family working at home or shopping, and it was much division and fighting. Then on the next day Sunday I began to work and they went to a Church. And almost each time they provoked me and asked me; “Are you will go with us to the Church today or not? “So, it’s been for a long time and was much fighting and I much wept before Yahweh, hopefully that He will do something and change these conditions in our family. And in 2000 we purchased a home in Virginia, and as I began to digging a root cellar and dumping this dirt across a street, I pulled a have cart, it’s like a small trailer behind my lawn mower, and it was too heavy and as I dumping, the tractor and a trailer pulled me to this ditch and tractor is felled on me and I was under this tractor. And when the people saw who are traveling on the street that tractor’s rollover-ed they rescued me from this tractor. I’m survived I’ve not died only; I’ve only broken my arm right here. So, they pulled me from this tractor and bring me home, and I was on a floor in garage tears filled my eyes from a such a pain because it was broken two bones . And my wife came to me and she looked very closely into my face and she said; “Do you remember how many times I’ve warned you, that you should not work on Sunday. It’s sin against heaven to work on Sunday, and I prayed to God, that God may correct you. And now my prayer is answered, God Himself correct you and showed you that working on a Sunday is a sin. This is why you have a broken arm. It is easy to listen somebody testimony, but when it touches you, it’s completely different story. I’m even not able describe how I feel at this time, but anyway. I survived,.. I’ve been in a cast for 3 months, and after my bones were healed, I come back again to a Shabbath keeping. And I refused it again, to go to Church on Sunday or keep Sunday. Then Yahweh became to correct me even more; He removed all pagan/worldly holidays from my life; Christmas, New Year, Happy birthday,.. Whatever you named in this world… Valentine’s day, Easter,… all these pagan holidays He removed from me at ones. And I’m no longer celebrate them from those times. Yet, it was another war, because of these. Because my family still celebrating and still enjoy to have these. And it was increase a war in our home every day, we never have a peace since we married. And it was something that I need to share it, because it’s was a very shaking time in my life. Its was so shameful, and so,.. and I can’t even describe. I felt very shameful and guilt, that I forsook Yahweh, that I turned so quickly from the path of righteousness. To these worldly lust, and obey my wife rather than Yahweh. Because a pleasure with wife, and pleasure in a family and enjoy a pleasure of this world, more to me became than a heavenly life. Many times, if you watch my others videos; my family, my wife called for police, hopefully they will kill me or at least put me in jail. But at those time it was not very successful. Until 2015. In 2015, October 2015 My wife and my children called for police, and they assault at me and put me in jail. After a jail, I was relisted to home. And my wife called for police again, and then again they assault on me in my home and drag me from my home. And said to me, if I will come back then I will be in jail for a long time. So, it was much suffering and persecution from my own family. It was a good answer from heaven. Then I understood that all that I suffered, and not only I, but all godly people who’ve suffered persecution imprisonment or death, it is good. it is a heavenly test, for our own improvement. I glorify My father which art in heaven, the King of Heaven El יהוה / Yahweh of hosts. Who has mercy on me again and again. Although, I suffered so much this is for my improvement. And remember brother, whatever you suffer, it is for your improvement. That you may stay before Yahweh, and be worthy. Not only stay before Him but live with Him forever and ever. Amen.